Behind the times on your fan speed control? No worries, because Aerocool is here to bring you up to speed with the latest and greatest in fan temperature adjustment. 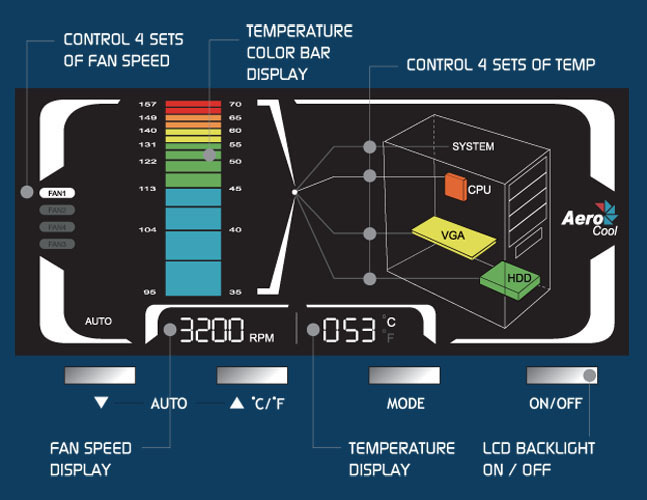 Featuring a colorful, easy-to-read LCD screen and a ton of helpful features, the Aerocool Modern-V Fan Controller is a simple-to-use component that will keep your PC safe long into the future. The 5.25" Modern-V offers full control of over four sets of temperature and fan speed, and even features an innovative alarm setting for additional protection from overheating. With your choice of auto or manual control, as well as the option to choose between custom and factory settings, the Aerocool Modern-V Fan Controller is the perfect item to put you in full control of your system.